A psychologist and her team of student sleuths have been assisting police in trawling archives for information on a 42-year-old murder investigation. Dr Penny Woolnough (Abertay University), who has worked with police for 14 years specialising in missing people, organised for the 12 forensic psychology students to get involved. Norfolk Constabulary and Police Scotland asked for help in finding information on the unidentified headless body of a woman that was found in Norfolk in 1974. The badly decomposed body had been found wrapped in a plastic sheet and clothed in a pink Marks & Spencer’s nightdress. Thanks to forensic evidence police found that the string binding her hands was manufactured in Dundee, and nowhere else in the world. 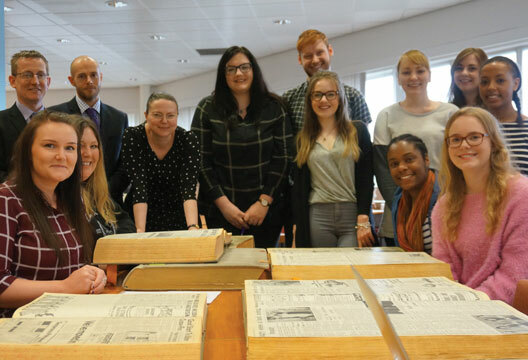 Students involved in the case, known as Operation Monton, spent weeks trawling through daily newspaper articles to find reports of missing women in the area creating information logs of any useful pieces of information, which were passed on to police. Dr Woolnough was approached by a Dundee police officer for help in compiling evidence in this case, she said she was keen to have the third- and fourth-year forensic psychology students see what real investigative work required.